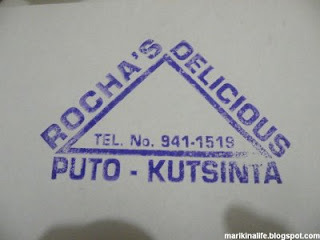 I've heard about Rocha's delicious puto and kutsinta from my tita who has been ordering from them for years. My tita said that I'd be lucky if I passed by their store and they were open. Reason is that they close store when all their puto and kutsinta are sold out. And take note, these tasty goodies get sold out as early as mid- afternoon. It was only this morning that I got to taste it and I have to say their tagline is true. It is delicious ! Their puto at first looks like kutsinta because of the color. But even if it doesn't look like the standard white-colored puto, it really is puto with cheese on top sporting a different shade of color. They sell a box of puto for P99. and each box contains 48 pieces. The best thing I like about their puto is that it's very soft and chewy. Unlike some brands of puto I've tasted which are hard and lumpy, this kind can melt in your mouth (if you can resist not chewing it up at first bite). The Original Rocha's Delicious Puto and Kutsinta accepts made to order for all occasions. You can reach them at 941-1519 for reservations. Their locatedacross the Children's Clinic along E. Mendoza street in Sto. Nino around the paliparan area. Will try it out next week koya! Thanks for the tip! @Az yeah ! lapit lang... sakay ka sa bayan ng trike. from dating rempson malapit na. Nakatikim na ata ako nito and it's very yummy! 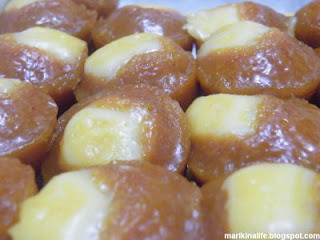 @gracie a box of puto is P98.00 and has 49 pieces. I cant remember how much the kutsinta is but if i'm not mistaken, it's the same price. you'll have to reserve to be sure to buy one. i wanna try this! pano pong pumunta dito galing santolan station? I assume you're commuting from Santolan LRT station. From there, you can take a Montalban or San Mateo jeep along Marcos Highway and get off at Bluewave Marquinton Mall (corner of Gil Fernando and Sumulong Highway). Then go to the nearest tricycle stand (there's one at the side of Robinsons Supermarket and the other one beside KFC Bluewave Mall) and take a tricyle to E. Mendoza St. 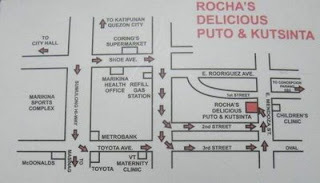 The tricycle driver just might know the place if you tell them you're going to Rocha's where they sell puto and kutsinta. Almost always, they're out of stock as early as 10am. So it's best to call up and reserve before going there so you'll be sure to take home your reserved order. Is that Aling Remy's puto also in Marikina ? well..well well Super sarap ng kay Aling Reming's PUTO, just recently lang natikman ko. pasalubong ng friend ko pauwi ng Australia, 1 thing I know pag-uwi ko uli sa Pilipinas hahanapin ko talaga ng pwesto niya sa MARIKINA. and eat as much as I could plus dadalhin ko sa mga Family and relatives ko dun sa MUNTINLUPA. This should be a secret recipe. 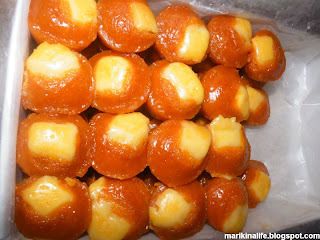 There are other puto-kutsinta that looks like this in the nearby area but doesn't taste the same. This original Rochas is far better than those with different brand. if you dont have anything good to say about rochas puto..stop! 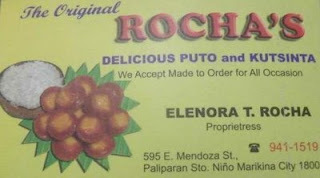 Rocha's Puto is now available also down south in Sta. Rosa Laguna! The original owners have recently moved and put up shop in Laguna Bel Air. You can buy their puto from the Paseo Market and they will also soon put up a small store near 7-11 Bel-Air. The Marikina shop is still operational and is being run by one of the sons of the owners. I just had my intern bring a box of Rocha's Puto here at our office. I had Remy's before and they are good. But after tasting Rocha's I have to say hands down this is pretty darn tasty. It's the type of good that makes you keep on putting the small brown things inside your mouth until it's all gone.